Much has been written about the rising prevalence of burnout among today’s physicians, with estimates approaching up to 70% feeling the effects. Unfortunately, when approaches on how to improve physician wellness and reduce burnout are addressed, they are usually centered upon self-care, practicing mindfulness, self-awareness and other strategies that place much of the burden on the physician themselves. Organizations and administrators who are placing the burnout burden right back on the shoulders of their own physicians are losing sight of a much larger issue. Physician wellness is directly impacted by workplace culture. That is not to discount other underlying factors, including work hours, patient loads, and administrative burdens, lack of autonomy, excessive bureaucracy, and other frustrations. What hospital administrators and executives might be overlooking is the fact that one of the top reasons physicians leave a job is a lack of cultural fit and not compensation. Gallup reported a direct link between staff understanding an organization’s purpose and culture and the achievement of quality healthcare. Physicians, like most people who have spent their life building a career, want a sense of fulfillment and personal accomplishment. And, to achieve that holistically, it needs to encompass more than the patient-facing aspect of their professional life. When they, like any employee, feels engaged in their work for an organization that espouses values similar to their own, they are happier and less likely to suffer from negative stressors. 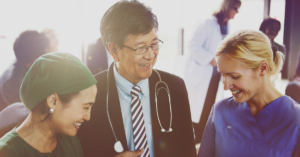 A recent Mayo Clinic White Paper on Executive Leadership and Physician Well-being outlined nine strategies to promote physician engagement and reduce burnout. Among the findings included organizational leaders having to acknowledge that there is a problem. A Jackson Physician Search survey showed that administrators believe their physicians are much more in alignment with the organization than the physicians are in reality. One consideration in finding out if there is a gap between belief and reality is through improved communication with staff at all levels. Others rely on annual surveys to get the feedback they need to take appropriate actions. Another strategy identified by the Mayo Clinic paper recommends cultivating community in the workplace. This goes further than celebrating achievements and having pot luck luncheons. More importantly, it is fostering the unique relationships that physicians have with their colleagues. 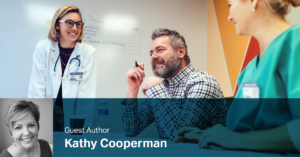 In the past, a physician’s lounge was a place where doctors would go to discuss shared experiences, develop interpersonal connections, and seek and provide critical peer support. Today’s focus on productivity requirements, administrative burdens, and other clerical demands have contributed to the erosion of these collegial relationships and can lead to feelings of frustration and isolation for the physicians. Strengthening values and culture is a strategy that most health care organizations, until recently, have not given the weight of importance that it deserves. In most healthcare-related organizations, the mission statement speaks to serving patients and providing compassionate, quality care. What’s often missing is that to achieve that mission, an organization’s culture, values, and principles must be in alignment, thereby creating the foundation for achievement. Other strategies to promote physician engagement, as discussed in the Mayo Clinic report, include the promotion of flexibility and work-life integration, providing the resources for self-care, and facilitating organizational studies to research new approaches supporting their physician team. To see all nine strategies for physician well-being from the Mayo Clinic report, click here. To learn more about how culture, values, and fit matter when filling your physician or advanced practice vacancies, contact the industry experts at Jackson Physician Search today.